By the five minute mark in How To Train Your Dragon 2, we’ve had instances of beautiful CG atmosphere, an exciting and fun action sequence, and an uplifting flying scene involving a young man with his magnificent flying pet dragon and winged suit. That’s the first five minutes, people – and there’s certainly more where that came from for its remaining 97 minutes, and even more than that. 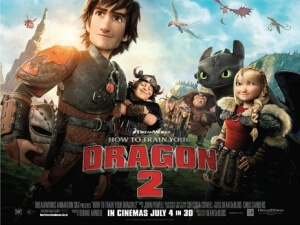 DreamWorks Animation, currently celebrating their 20th anniversary, has a healthy habit of making first sequels that manage to outshine their predecessor, whether they’re Shrek 2, Kung Fu Panda 2 or even Madagascar: Escape 2 Africa. This, the first sequel (of a planned trilogy, with #3 coming in 2016) to their surprise 2010 hit, is no exception but still manages to make some bold and noble choices in its storytelling that leaves a bigger mark than they’ve managed before. Sacrifices are made, there’s more to lose this time round, the hardships are too many to count; it’s definitely a darker follow-up but it’s one that children can watch just fine without there being any alienation. This movie, more so than even its predecessor, manages to treat audiences with respect and kindness. It rewards their intelligence by giving them something that doesn’t talk down to them with needless pop culture references or obnoxious character traits (perhaps this is why lesser efforts like Shark Tale and Turbo failed miserably, because they tried to be a product of the times and ended up becoming instantly dated). It’s the kind of family film we need nowadays that sets the record straight with younger viewers without sugar-coating any of the dire situations certain characters find themselves in. In short, it’s a smart movie for any age group to watch and enjoy. There are, of course, traits from the previous film that are carried over to this one and expanded to increase the impressive dramatic struggle. The animation still looks absolutely stunning, with some of its more atmospheric shots (including aforementioned opening five minutes) looking particularly detailed and even lifelike. The designs of each individual dragon is dripping with colour and personality; even the human characters have physically aged over the five-year gap between films 1 and 2, with subtle additions here and there (including stubbles on the face of its younger males and a hint of greyness in Gerard Butler’s Stoik ginger beard) to indicate their aged state. It’s a very unique step for a family sequel to make, especially in animation where it would have been so easy to have the characters look the exact same. There are even some visuals that harken back to the strongest of Hayao Miyazaki’s work, or at least that’s what you’ll be comparing to when you see it, it’s that incredible. In addition, the characters are great – though Jay Baruchel’s nasally voice as Hiccup may get on people’s nerves after a while, his character’s good will still shines through and he makes for a strong leader. He shares good, believable relationships with Butler’s Stoik, America Ferrera’s on-screen romantic lead Astrid, and the other comic relief characters as played by Jonah Hill, Kristen Wiig et al (though none of them get on your nerves as many animated comic sidekicks do). Out of the newcomers, Cate Blanchett fares best as Valka, who as it turns out is – not a spoiler, it’s in the trailers – Hiccup’s long-lost mother; hers is a very likable character to warm to and pray that she at least comes out of events fine and without sudden u-turns such as making her the surprise villain a la Frozen. Speaking of bad guys, Djimon Hounsou is unfortunately paired with a very uninteresting villain character who just seems evil just for the sake of it, and is given little to no backstory to justify his needs to do what he wants to do. Game of Thrones’ Kit Harrington also pops up as an ally for the heroes, and though some of his line readings are a little stiff Harrington is still a fun presence. It will be interesting to see how they use him in those later sequels. With two strong films now to its name, the How To Train Your Dragon franchise is turning out to be one of the finest animated franchises ever since Toy Story ended and Shrek lived happily ever after. Let’s hope it doesn’t go south as is typical for most #3 films but given the current track record, don’t count on it. How To Train Your Dragon 2 is an exciting, emotional, dark and beautifully-animated adventure movie for everyone to enjoy – if it proves anything, it’s that this should be the format for most summer blockbusters nowadays.